Yamaha has added two new pianos to its flagship CP range. The CP4 and CP40 both pack many of the features of the company's CP1 piano into a more-affordable instrument. The CP4 features a range of 433 voices, and includes Yamaha's Advanced Wave Memory sampling technology. The CP40, meanwhile, features a selection of 297 modern and vintage piano sounds. The two instruments will be priced at £2035 for the CP4 and £1526 for the CP40. Check out the press release below for details of each. Yamaha Music GmbH has unveiled the CP4 and CP40 STAGE Pianos, two exceptional new instruments set to build on the impressive reputation of the company's flagship CP1 model. The legendary CP series rose to fame in the 1970s and 80s when the pioneering CP70 and CP80 revolutionized the way professional keyboardists thought about stage pianos. The CP1 revitalized the range in 2010 and now these two new models incorporate many of its innovations - but in a more budget-friendly package, making the new CPs more accessible to semi-professional musicians and the educational, institutional and budget studio sectors. Sound Collection', comprising Yamaha's CFX flagship concert grand piano, the CFIIIS concert grand piano, the S6 handcrafted piano, DX7, CP80, and a wide and highly useable range of well-known vintage electric piano sounds. The phenomenal CP4 STAGE sound set features 433 Voices, including many of the AWM (Advanced Wave Memory) samples made famous by much more expensive Yamaha digital and Hybrid pianos. All the sounds have been meticulously selected by Yamaha product specialists and artist partners to provide enormous creative options for any live or studio setting. This huge array of sounds are played from an 88-note wooden graded hammer keyboard with synthetic ivory keytops which replicates the feel of a concert grand with amazing accuracy. The CP40 STAGE offers a slightly more modest sound library, but its 297 Voices include a sound set with a range of Yamaha premium piano (including the Yamaha CFIIIS grand piano) and vintage sounds - more than sufficient for most players. Plus, there are many of the key features available on the CP4 STAGE, including the full 88-note graded hammer keyboard and 128-note polyphony! 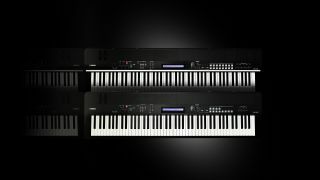 Both new CPs can act as sophisticated and comprehensive master keyboards to control external MIDI devices, and offer a 4-keyboard zoning capability. Additionally, they have extensive audio recording and playback functionality, complemented by intuitive split and dual keyboard modes. Both models feature stylish, slimline designs resulting in an astounding low weight of about only 17 kg. With a user interface designed to offer key features at top level, and with ease-of-use being the key objective, both the CP4 and CP40 STAGE will prove highly attractive to serious gigging and recording players on a budget. Connectivity on both models is extensive and should satisfy the most demanding of stage and studio requirements. Options include audio inputs, XLR-balanced outputs, MIDI and USB to-host and to-device.